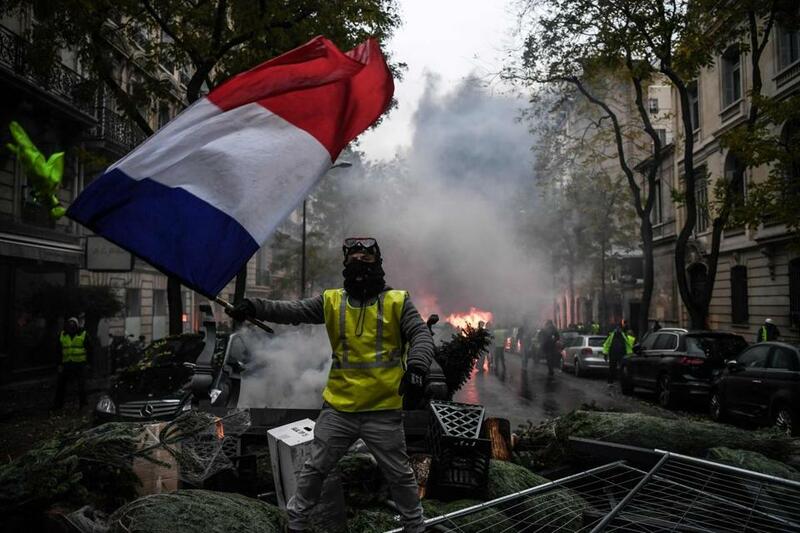 France’s so-called “Yellow Vests” protest has resonated with some on the American left, who argue that gas taxes are little more than a regressive levy on the poor. But they’re dead wrong. Last month Americans watched California burn in wildfires that left dozens dead, thousands homeless, and San Francisco shrouded in smoke. It was the type of climate catastrophe scientists warn will become increasingly common as we pump more and more carbon into the atmosphere. Weeks later, we watched what’s likely to be another recurring spectacle — fires in Paris as citizens burned cars to protest higher fuel taxes designed to limit carbon emissions. First of all, we know higher fuel prices work to lower consumption, whether they’re the result of taxation or high market prices for crude oil. Between 2008 and 2013, when American fuel prices spiked, the result was the first net reduction in miles driven by Americans in generations and a shift away from gas guzzling sports cars, SUVs, and trucks to more fuel efficient models (a trend that has sadly reversed since 2013 as prices have fallen again). In Norway, where high gas taxes make gas cost nearly $8 per gallon, electric vehicles are now over half of new car registrations and Norwegians are on the way to meeting their goal of eliminating gasoline-powered vehicles from their roads by 2030. The federal gas tax has been stuck at only 18 cents per gallon since 1993, and doesn’t rise with inflation. It’s too low even to pay to repair our crumbling roads and bridges, much less reduce consumption to a sustainable level. Even in heavily Democratic Massachusetts, voters in 2014 overturned a law that merely indexed the state gas tax to inflation. Meanwhile, transportation has become America’s largest source of carbon pollution, recently overtaking power generation. It’s no mystery why conservatives oppose gas taxes, and why billionaire oil activists like the Kochs spend fortunes to lobby against them. They prefer to ignore climate change, since action to prevent it hurts their businesses. So it’s dismaying to see left-wing activists agreeing with them out of a misguided belief that these taxes will hurt working people. Honest climate scientists acknowledge the limits of their work. But like defense lawyers in a TV drama, President Trump uses any flicker of doubt to let climate change go scot-free. The thing is, our status quo, in which we expect every American adult to commute by car, is already a capitalist catastrophe for the poor. We live with an unspoken and unexamined expectation that every adult American will purchase a car, then be on the hook for thousands of dollars a year in insurance payments, gas, and maintenance. AAA estimates that the average yearly cost of ownership for a new car is $8,500 per year, a ruinous expense for low-income Americans. To add insult to injury, heavy government spending on commuter highways and sprawl has allowed the wealthy to decamp to segregated suburbs, bankrupting many older,urban communities. It’s saddled these communities, many of which had those same commuter highway projects built literally on top of them, with a disproportionate share of automobile pollution and traffic deaths. A 2013 study by the Boston Public Health Commission suggests Roxbury and Dorchester have among the region’s highest rates of asthma, a health measure closely linked to car pollution. The beneficiaries of all this damage and expense are multinational companies like General Motors, ExxonMobil, and Wall Street banks. In this climate crisis, we’re already out of time to start raising the price of gas, but we can’t stop there. We must invest in expanded public transit infrastructure to link workers to jobs, especially in poorer areas that were intentionally passed over by racist postwar planning decisions. In areas that are already connected to transit we need to build more affordable housing and denser, walkable neighborhoods. Many Bostonians already prefer these sorts of neighborhoods, like Beacon Hill and the Back Bay — they’re in such high demand that they’re unaffordable for most working people. But car-oriented zoning policies have made it difficult to build neighborhoods like this today, encouraging exurban sprawl instead. They must be reversed. Our experiment with auto-oriented development had already proven itself economically calamitous for the poor and destructive to our communities, even before we found ourselves in a climate crisis. It’s time to end that experiment, starting with the artificially cheap gas that fuels it. Michael Sweeney is a transit advocate and film editor. Follow him on Twitter @mtsw.